In just five days you will explore the best the Northern Territory has to offer. Departing from Darwin, you will spend two days in beautiful Kakadu National Park. Hike to see ancient Aboriginal rock art, waterfalls, and deep gorges. Then make your way south to Katherine, the center of the vast Katherine region. Explore the majestic Katherine Gorge in the Nitmulik National Park, take a dip in the Katherine Hot Springs, and hike to Edith Falls. As you drive north, you will stop in Batchelor, gateway to Litchfield National Park. Known for its beautiful waterfalls and cascades, the park is also home to the Lost City ruins and magnetic termite mounds. On your last day, drive back to Darwin for some al fresco dining and the fun Mindil Beach Sunset Markets. Drive approximately 256 km east (just over 3 hours) via the Arnhem Highway to Jabiru on the eastern end of Kakadu National Park. The only town in Australia located in a National Park, Jabiru is one of the few places in the area where you can stock up on supplies. Plan to spend 2 nights in Jabiru, to make the most of Kakadu National Park. A 'must see' while visiting Kakadu National Park, the 150 metre high cliffs surround a clear plunge pool with white sandy beaches. Due to the fact that the site can only be accessed via 4WD vehicle, and is part of the Arnhem Land escarpment, which requires permission to visit, consider signing up for a 4WD tour. Today your journey takes you just 302 km south (a little under four hours) via the Kakadu and Stuart Highways to Katherine. 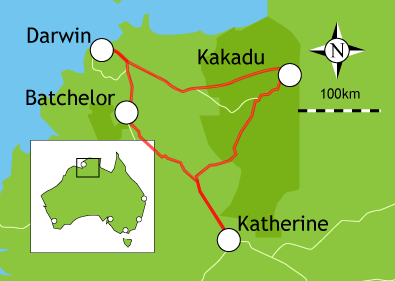 The third largest town in the Northern Territory, Katherine is the center of the Katherine region, which covers 480,000 sq km. Europeans began exploring Katherine in 1844, and the town and the river that runs through it were named by John McDouall Stuart in 1862. The town and nearby areas offer numerous outdoor experiences ' a true nature lover's paradise. Home to the Jawoyn and Dagomen Aboriginal people, Katherine was renamed 'Nitmulik' in 1989 when the original people gained the titled to the land. The town and the region are still referred to as Katherine, but the nearby Nitmulik National Park reminds visitors of its true name. The next leg of your adventure takes you 234 km north (about three hours) via the Stuart Highway to Batchelor, gateway to Litchfield National Park. Now primarily devoted to tourism, Batchelor had its own minor gold rush and served as the Allied Air Force Base during World War II. The area is also famous for nearby Rum Jungle, named for legendary rum drinking binge and the site of a uranium mine from 1951 to 1963. Hands down, the most popular spot at Litchfield National Park is Wangi Falls, one of three spring-fed waterfalls cascading from the sandstone plateau; the other falls are Tolmer and Florence). Wangi Falls are the biggest in the park, its waters flowing into a swimming hole surrounded by monsoon rainforest. Swim, snorkel, or spend then entire day; Wangi Falls has numerous amenities, including disabled bathrooms, picnic areas, sheltered areas, BBQ facilities, a car park and a kiosk. Take the 3 km interpretive walking trail. Located on the coast of the Timor Sea, Darwin has a thriving wharf and harbour, most of which can be traveled using the city's extensive bike paths. Darwin is known as a 'young' city, exemplified by a vibrant nightlife, mostly concentrated on Mitchell Street. World class cuisine with seafood as the star, rich cultural and art experiences, open air markets and beautiful gardens make Darwin the perfect place to extend your trip!